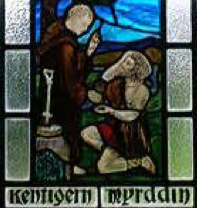 Myrddin Wyllt was a 6th century Welsh poet and prophet, and, as some stories suggest, a madman. He holds a legendary place in Celtic medieval history and is also known by the names Merlinus Caledonensis or Merlin Sylvestris. These names suggest that he could have been the wizard Merlin of Arthurian legend. The possibility that this could be true was suggested by Geoffrey of Monmouth, a 12th century cleric and historian who studied the histories of the kings of Britain. Records show that he was born around the year 540 AD and could have had a twin sister called Gwendydd or Gwenddydd. The legend holds that he was involved in a great battle some time in 573 between the pagan Celts and invading Christian forces and the death of his Lord caused him to lose his sanity. It is said that he fled to the woods for safety and ended up living with animals, eventually finding that he could prophecy events to come. He even prophesied the means of his own death which occurred in extremely bizarre circumstances. Nothing is known about his early years but he appears to have grown up with a talent for writing verse. He was appointed official bard to the Welsh lord Gwenddoleu and it was the death of this nobleman, with whom Myrddin was serving, that prompted his flight into the forest and led to a state of madness. Works of Welsh literature that survive from the period when he was alive may have been written by him although the origins cannot be proved beyond doubt. This was a time though when all the Celtic tribes of Britain – the Welsh, Scots, Irish and even those of ancient Kernow (latter day Cornwall), were in constant conflict with the English and invading Normans. The great desire, of course, was to defeat them and push them all back into the sea. Understandably, considering the ancient roots of this story, there are doubts about whether Myrddin Wyllt was actually Welsh. A character from North Britain called Lailoken has a similar story and some historians suggest that they are one and the same man, originating from the Scottish region rather from Wales. Indeed, reports of the deaths of both men are virtually identical, thus confirming that they were, in all probability, the same. One of Myrddin’s famous prophecies was that he would die by three methods – falling, stabbing and drowning. This unlikely combination of events actually happened, according to legend. Perhaps alarmed by his unruly appearance, close to the edge of a cliff, a group of shepherds set upon him, forcing him over the edge where he fell to his death below. Incredibly his body was impaled on a stake that had been left there by fishermen and soon the waters covered him. His prophecy, in that case, was totally accurate. This happened somewhere in the Selkirk area of Scotland, thus giving credence to the above suggestion that he was also Lailoken. Conflicting reports of the death of Myrddin Wyllt place the date sometime between the years 584 and 612. He would therefore have been either in his mid-forties or early-seventies when he died.